The treatment for acute lymphoblastic leukemia (ALL), the most common childhood cancer, has vastly improved in last 50 years; the 5-year survival rate has risen from 0% to around 85%. However, if a patient experiences a relapse, they only have about a 10% chance to survive. Promisingly, last December, scientists reported that 24 of 27 patients with relapsed ALL were able to achieve complete disease remission using a new form of therapy: chimeric antigen receptor T-cells or CARs. CARs combine our scientific knowledge of genetics, the immune system, and cell engineering to provide a massive leap forward for medicine. They promise not only a new and effective cancer treatment but also a way to battle almost any human disease. 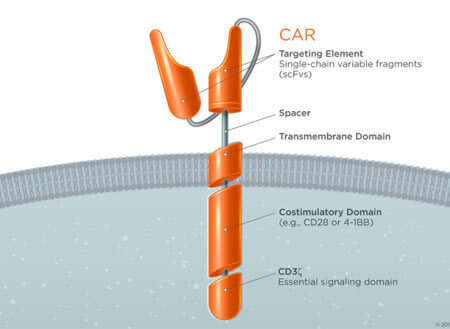 To understand CARs we have to learn about the cell they augment, the T-Cell. 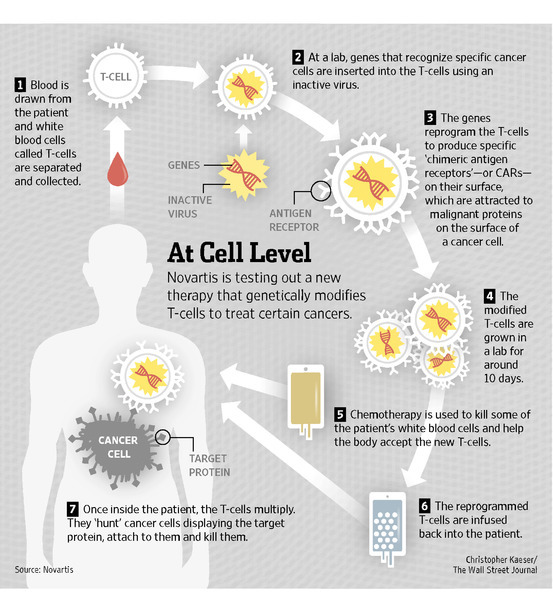 T-cells are a component of the immune system with many disease-fighting functions. One of those functions is their ability to specifically target and kill damaged cells. 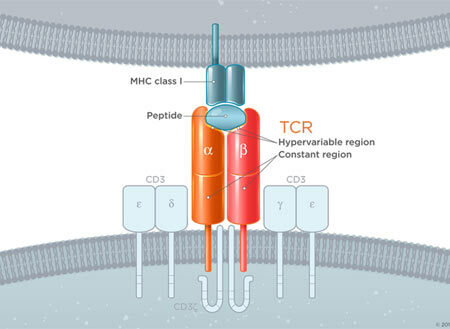 T-cells recognize damaged/infected cells by utilizing a receptor on their surface called a T-cell receptor (TCR). This highly specific receptor is able to bind to a receptor on the surface of all cells but only strongly binds when its specific target. When these two receptors strongly bind and a host of other important secondary requirements are met, the associated proteins down-stream of the TCR create a signaling cascade that results in the death of the targeted cell (Image 1 Top). The power to destroy any cell is obviously very great, but with any great power comes great responsibility. To prevent T-cells from destroying healthy tissue, the body prevents T-cells with self-recognizing TCRs from becoming active. Since cancer cells arise from normal cells and look very similar to healthy cells they are usually not targeted by T-cells* and, thus, a potent anti-disease system we have evolved fails to attack cancer. However, by tweaking the TCR to create a receptor that can recognize cancer cells and initiate targeted cell death without the usual checks and balances we create a potent anti-cancer treatment. These custom-engineered receptors are known as Chimeric Antigen Receptors (CARS!) and only need to recognize a cancer cell to set off a chain of events leading to cell death (Image 1 Bottom). Image 1 – (Source: https://junotherapeutics.com/our-science/car-technology/) (Image 1, top) You can see that to function properly the basic TCR requires a concert of multiple associated proteins. These other proteins ensure that a native T-cell does not cross react against normal tissue. (Image 1, bottom)The CAR on the other hand is engineered to work without all the other associated proteins and will trigger cell death when it encounters a molecule specific to the targeted cancer cell. Conceptually CAR therapy sounds simple: Take cells specialized at destroying diseased cells and augment them to target cancer. But, unfortunately, its implementation in the clinical setting is much more complex (Image 2). CAR therapy takes advantage of another remarkable technology called adoptive cell transfer, in which a doctor draws blood from a patient and extracts out the naturally occurring T-cells. Then, in the lab, scientist create a gene blueprint for a chimeric antigen receptor specific for the patient’s cancer. The doctor then uses a special virus to take the gene and place it into the patient’s T-cells, creating CAR T-cell. These CARs are vastly expanded in number and potency in the laboratory and then transferred back into the patient where they go directly to the cancer cells and destroy them. In the case of ALL, researchers created a CAR to target a molecule on the surface of the leukemia cells, CD19**, that allowed the T-cells to destroy the blood cancer. By reprogramming cells, as is done in CARs, we are able to greatly extend the power of our therapeutics. It is at one time cell therapy, gene therapy, and immunotherapy. Of these, cell therapy alone is a giant leap forward. The vast majority of our pharmaceuticals are small chemicals and although we have been able to alleviate many medical conditions with these small molecules they have many limitations. They cannot directly perform complex functions such as destroying a cell. They are delivered to all tissues without any inherent disease targeting, lack an on/off switch, and once consumed; they need to be administered again. Using programmed cells gets around all these limitations. Cells inherently perform complex functions, they have built-in targeting mechanisms, they can be turned on or off as needed, and, if properly used, they can persist in the body fighting disease for months. Clearly, the promise of the CAR therapy is great and the medical community has not failed to take notice. At the time of writing this article there were 150 ongoing clinical trials using CAR therapy (Current CAR clinical trails). These trials focus primarily on lymphomas and leukemia but include everything from colon cancer, several types brain cancers, liver cancers, HIV, melanoma, multiple myeloma, breast cancer, and more. Many of these trials are actively recruiting patients and if you or a loved one has refractory disease I would strongly suggest taking a further look at clinical trails.gov with your physician. The promise of CARs has not been missed by the pharmaceutical and financial industries. Juno, the Seattle-based company responsible for the trial of CARs on acute lymphocytic leukemia I mentioned earlier, raised $264 million in its IPO last December, the largest biotech IPO of 2014. Given they have several CAR therapies in clinical trials their valuation is now over 4.6 billion – the largest biotech of this decade. Juno is not alone as a CAR therapy IPO within the last year: France-based Cellectis ($228 million), Houston-based Bellicum $160 million), and Kite Pharma, from Santa Monica, California, ($134 million) are other notables. Larger pharmaceutical companies also made deals in the CAR therapy space. Novartis made an undisclosed deal with UPenn for primary research and clinical trial support, Pfizer with Cellectis for $185 million per product and Amgen with Kite Pharma for $525 million per product. Regardless of who creates commercial successes in this field, the influx of money should lead to primary research that makes effective new therapies possible. CARs however are not perfect. They share limitations with traditional therapeutics, namely toxicity. In the case of CARs side effects come in two main forms. The first is known as cytokine release syndrome (CRS) and the second major side effect is tumor lysis syndrome (TLS). During an infection, T-cells release chemicals called cytokines, which coordinate the body’s infection response. These cytokines lead to the fever and aches we are all used to when we are sick. However when too many of these cytokines are released, they lead to dangerously high fevers, unsafe drop in blood pressure (hypotension), and fluid buildup in the lungs (pulmonary edema) that can lead to death. There have been half-dozen deaths related to treatment with CARs attributed to CRS. TLS, on the other hand, is actually a result of CAR therapy destroying cancer cells too quickly. As tumor cells die they release their internal components into the blood stream. These include potassium and phosphate which are found predominantly within cells and the body must work hard to clear them from the system. The rapid increase in potassium results in cardiac arrhythmias and elevation in phosphate levels can irreversibly damage the kidneys leading to kidney failure. Both of these side effects, however, can be mitigated if not prevented. Newer generation CARs and co-administration of pharmaceuticals with CAR therapy can mitigate the cytokine storm. Likewise tumor lysis syndrome can be treated with observant medical management. If you aren’t excited enough about CARs there is another exciting development in engineered cell therapy. For the majority of us our immune system is a potent disease fighter. However, when the checks and balances fail, the immune system can turn on healthy tissue and destroy it. The class of diseases that result from this pathologic process are called auto-immune diseases. The list of auto-immune diseases includes type I diabetes, lupus, multiple sclerosis, celiac disease, Crohn’s disease, ulcerative colitis, and many more. For the most part, there is no great therapy for any of these diseases and those afflicted deal with lifelong impairment. However, some recent work using a sub-type of T-cells called regulatory T-cells (Tregs) has shown promise at diminishing and, in some cases, eliminating auto-immune diseases. A study in 2012 showed that Tregs could reverse type-1 diabetes in a subset of children treated soon after developing the disease, preventing life-long insulin dependence (http://www.ncbi.nlm.nih.gov/pmc/articles/PMC3425004/). Building on the CAR research, engineered Tregs with specific targets have been reported in scientific literature, but a clinical trial utilizing them is still pending. One could imagine a world where custom-targeted Tregs could diminish only the T-cells leading to auto-immune disease while leaving the remainder of the immune system intact….providing our first promising targeted therapy for auto-immune disorders. CARs have come a long way since first envisioned in the 1980s. They offer us a new exciting therapeutic option for cancer and may lead to the first curative therapy for auto-immune diseases. Their biggest promise is a platform to advance cellular engineering. Using the knowledge gained from CARs we will one day program a wide range of cells to carry out functions currently in the scope of science fiction. Cells able to regrow damaged tissue, suture sources of internal bleeding, grow new brain cells, and even cells that can serve as an interface our biology to mechanical and digital creations. * – Some lymphocytes are found within/surrounding tumors, called tumor infiltrating lymphocytes (TILs). A subset of TILs actually do show anti-cancer therapy and taking advantage of them with the adoptive cell transfer protocol has shown major benefit in diseases such as metastatic melanoma. Utilizing these TILs was also the heart of an amazing clinical trial involving only 1 patient (http://www.sciencemag.org/content/344/6184/641.abstract). ** – CD19 is actually on the surface of all B-cells not just the diseased ones in leukemia. Targeting them with therapy wipes out the good and bad alike but healthy immune function seems to bounce back after therapy. Very interesting article. In my family we have autoimmune UC, thyroid and celiac disease. I have autoimmune thyroid. My mother at 86 has mantle cell lymphoma stemming from her celiac disease. I find your article hopeful. Do you have an idea of when it will come to market? Synthetic blood: the future of blood transfusions.